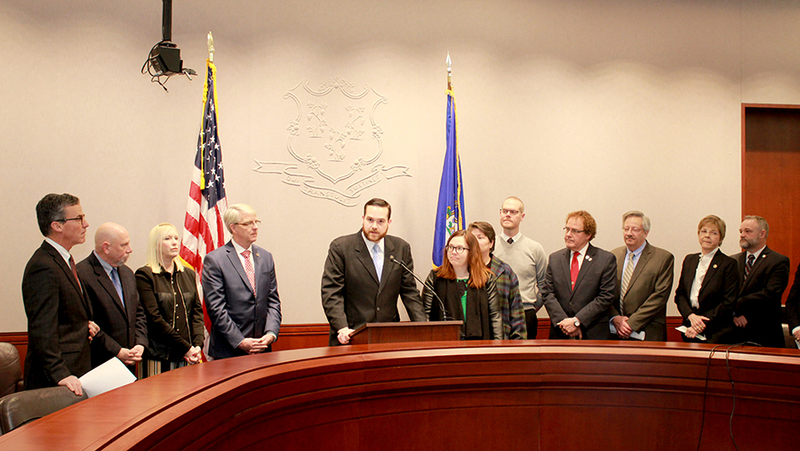 HARTFORD – Today, over a dozen members of the House and Senate Republicans sent letters to President Donald Trump, Senate Majority Leader Mitch McConnell, and House Speaker Paul Ryan urging the Republican leaders to support amendments from U.S. Senators Christopher Murphy and Richard Blumenthal and Reps. John Larson and Joe Courtney that will provide help to homeowners living with a crumbling foundation. The Connecticut House and Senate Republican members are asking for Republican leaders in Washington D.C. to pass the following amendments. House Amendment 881 to H.R. 6147 seeks to provide funding for the U.S. Geological Survey to develop a map showing pyrrhotite occurrences across the United States. This would help to ensure residents of other states never have to grapple with this crisis in the future. House Amendment 292 to H.R. 3354 seeks to provide funding in the Community Development Block Grant program to examine the application of grant funds to mitigate and remediate the effects of pyrrhotite-related damage. House Amendment 934 to H.R. 6147 seeks to provide funding within the Department of the Treasury, Departmental Office towards a study, led by Treasury with the participation of relevant regulators, to examine the financial impact of the mineral pyrrhotite in concrete home foundations. The study would provide recommendations on regulatory and legislative actions needed to help mitigate the impact on banks, mortgage lenders, tax revenues, and homeowners. Click below to view letters.